The belief of chastity had shaped Mother Teresa’s identity as it showed how devoted she was to God. When she received her calling she was at a young age but thought about the calling for 5 years until she was 17. As a child, girls don’t tend to think about getting married and starting a family but once they become adolescents they question whether to start looking for someone and having children on their own. For an adolescent to give up the opportunity to spend their life with someone and have children of their own in future is difficult. By taking this vow, it shaped Mother Teresa to be more devoted to her calling and to helping others and has shaped her to be a strong independent woman as she chose her own path, stuck to it and then devoted her whole life on it on her own and then with others. The belief of poverty or helping the poorest of the poor had shaped Mother Teresa’s identity as she was able to have an open mind about world and the people around her instead of just focusing on herself or materialistic goods. By not focusing on materialistic goods or herself, she put other people before herself. An example of Mother Teresa putting people before herself is when she asked to leave teaching at St Mary’s High school where she taught Geography and soon after became the principle. She felt that her calling was not fulfilled and left to work with the poorest of the poor in the slums in Calcutta. Here, she devoted a majority of her life looking after the poorest of the poor and help enlighten them by keeping them company and looked after them even though at times her life was put at risk. Soon after, she was then able to help more people by creating hospices and a charity where more people could also help the poorest of the poor. The belief of obedience had shaped Mother Teresa’s identity as it showed how strongly dedicated she was to God and the service of others. When Mother Teresa had accepted the calling to become a nun and help the poorest of the poor, she stuck to what she was told to do and didn't think of other situations. For example, Mother Teresa helped and looked after the ‘untouchables’. The ‘untouchables’ were the ones who were diagnosed with contagious diseases such as leprosy. Instead of pulling out as her own life were to be at risk as she would develop the disease, she stuck to her calling, obeyed God and continued to help the poorest of the poor and the untouchables. This shaped Mother Teresa’s identity as a devoted woman to the service to others and God himself. The belief of dignity of a human being allowed Mother Teresa to value everyone’s life. It shaped her to become a better person by putting others before herself trying the promote equality whether you are rich, poor, ill or homeless. 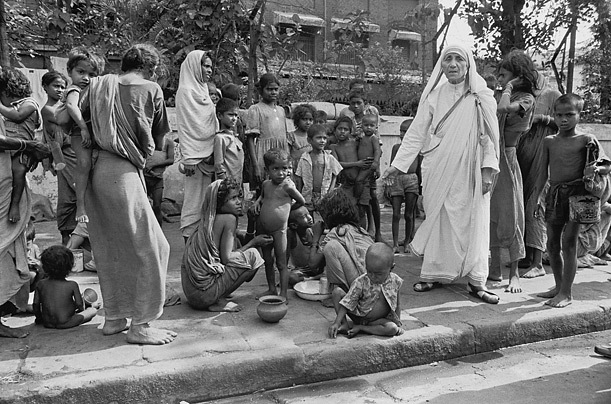 An example of an event that allowed Mother Teresa to become a better person to promote equality was when she arrived in Calcutta. The area was in the slums surrounded by poverty and people who were dying from illnesses or starvation. Mother Teresa valued the life of others and became a better person as she, out of many people who could have helped took the effort to look after them and provide them food. She would collect left over food for people instead of letting people throw it out and waste it. As well as feeding them, she also nurtured those who were dying in hospices and also offered to keep the children if their parents wanted to perform abortion. The belief of wealth should be distributed evenly shaped Mother Teresa to be compassionate and not self-centred. During Mother Teresa’s life she had won many awards which included a lot of money. Instead of keeping the money to herself she distributed her money to the centres and hospices she made so it could be used to provide the people who were abandoned, diseased or disabled. An example of which the money was used for in the charity centres and hospices were to buy more food and resources such as more beds so they could take in more people and look after them. This shaped Mother Teresa to compassionate and not self-centred as she is always concerned for others. If another person were to receive money from an award, it is most likely that they would use the money for materialistic goods such as getting a bigger house or expensive cars.